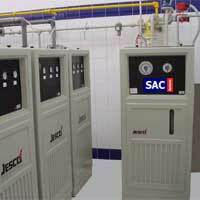 SAC chlorination plants represents the State-Of-The-Art technology in this field with the highest degree of safety. SAC range of plants covers every demand starting from small plants required for swimming pools and small districts and up to large plants in large cities and Olympic swimming pools. SAC plants consists of high quality well-matched components that cover all requirements from chlorine metering to sampling, analyzing and warning equipment. Depending on the degree of automation required, SAC plants can be fully automated with PLC based control system or semi automatic or simply manually operated.